Innovative Rotherham firm, Metalysis, has started a second phase of research into 3D printed permanent magnets which could help solve a potential crisis in the electric vehicle industry. Backed by investors and grants, the Cambridge University spin out secured £20m of investment last year and recently opened a Materials Discovery Centre in a 22,000 sq ft unit on the Advanced Manufacturing Park (AMP) in Rotherham. It is also scaling up production of titanium at its Farfield Park premises. Earlier this year Metalysis formed a partnership with Mkango Resources Ltd, a Canadian listed mineral exploration and development company, to work on rare earth permanent magnets that are a critical component of many electric vehicles, as well as other consumer and green technologies, and are at risk of shortage. Mkango has now secured a further £500,000 to support the commencement of a Phase II R&D programme with Metalysis. The project is focused on mining rare earth elements (REE) and associated minerals in the Republic of Malawi, and the parties envisaged a comprehensive research and development programme, culminating in the joint pursuit of commercial opportunities. One such opportunity includes evaluating the UK as a future host country for a manufacturing plant to exploit a commercialised technology. The first phase saw the production of a neodymium-iron-boron ("NdFeB") alloy powder achieved using Metalysis' solid-state technology which uses electrochemical reduction to transform metal oxides, such as ores, directly into metal powders in a single step. NdFeB alloys are used to make permanent magnets and an exclusivity agreement has now been signed for advanced alloys using neodymium or praseodymium with other elements for magnet manufacturing. Neodymium oxide prices have approximately doubled since the start of the year, and Mkango said that the supply - demand outlook for rare earths used in permanent magnets is very positive. Dion Vaughan, chief executive of Metalysis, said: "We are very pleased to commence Phase II of our R&D programme with Mkango. Producing a neodymium-iron-boron alloy illustrates the wide range of advanced alloys Metalysis' process can produce. We look forward to collaborating with Mkango over the coming months on this exciting project." Other R&D projects currently being undertaken by Metalysis include one focused on a high value aluminium-scandium alloy that is being carried out with an international partner. It is also supporting the development of Kazakhstan's metal additive manufacturing industry with Metalysis technology used to develop metals and bespoke alloy powders suitable for additive manufacturing. 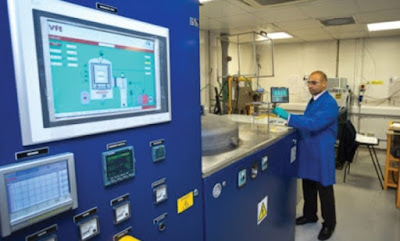 Metalysis is also part of the FASTforge project, alongside the Advanced Forming Research Centre (AFRC),the University of Sheffield and Safran Landing Systems.